Hello #Bassgrls! Your club administrators and I collaborated on a special shirt to help promote your club and give you the best sun protection apparel! 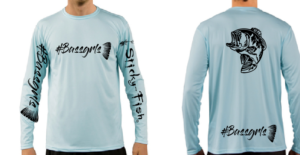 You have a few colors to choose from, and you can get matching shirts for your future #Bassgrls! The apparel is 50 UPF, and the manufacturer suggests selecting one size larger than what you normally wear; the fabric is expected to shrink upon washing, which in turn increases the UV protection! You and your children can get maximum coverage while in the outside. The dry fit technology is antimicrobial and quick drying. For EVERY product purchased here for #Bassgrls, we will give $5 to the group administrators to fund giveaways and tournament needs. We are excited to help the group grow, and this is a great way for my company to help.